Why Do Your Best? 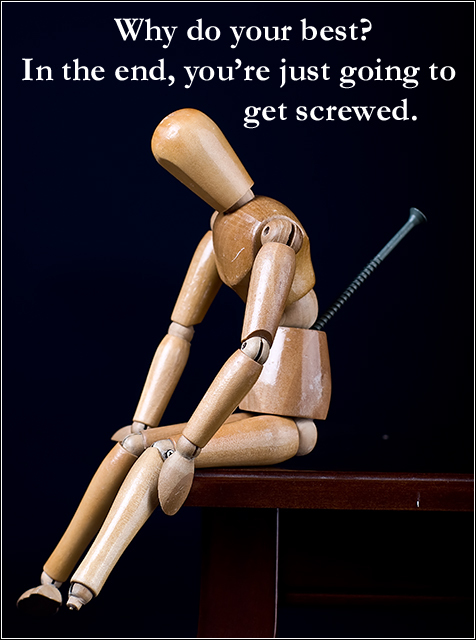 In the end, you're going to get Screwed. I really liked this and thought it would place higher. I gave it a 9 myself. I really like the fact that its witty. Looking at this just makes me vary depressed which is what it looks like you were going for. good job. Nice detail on the woody. The broken foot is a nice touch. Simple and an effective message here. Meets the challenge nicely. Well done. Why the screw is in the back?! think it should read "you're going to get screwed in the end"
Proudly hosted by Sargasso Networks. Current Server Time: 04/23/2019 12:06:55 PM EDT.